In a relatively new function on the now reigning king of "social internet", there is the ability to declare your fanship of Buzz Canuck as a blog. You may not have ever left a comment, you may not have created a trackback, perhaps you've just put Buzz Canuck in your RSS feed by mistake, came by because you were searching for the term "schadenfeude" and I use it too much or perhaps the smallest category, truly do enjoy the 5 times/week posts that we grind out - either way, I'd appreciate your public declaration of support and evangelism. 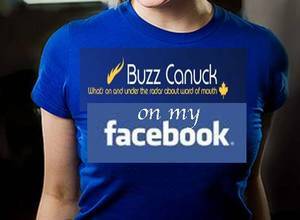 Go here for the Buzz Canuck blog network on Facebook and if you're a fellow blogger, place your blog up too and ask me to join.